It’s Sweepstakes Time, Ladies! Cross Your Fingers, Rub Your Lucky Pennies, And Sign Up to Win! 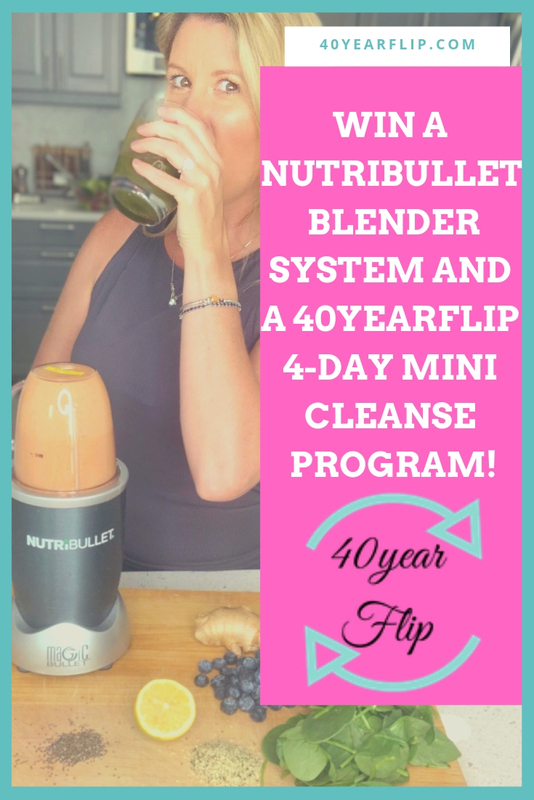 Who wants to win a NutriBullet Blender/Mixer System and a 40yearflip 4-Day Mini Cleanse Program? I love our NutriBullet. It has been with us for almost 4 years and it whips us up smoothies every morning. We also use it for soups, dressings, and so much more. I never put it away because I reach for it at least once a day. So, when I thought about what I’d love to give to my readers, a NutriBullet system was the first thing that flipped into my head. “The NutriBullet System is quite simply the best product out there to make healthy, nutritious drinks that can help you fight and prevent disease, lose weight, relieve joint pain, promote healthy, younger-looking skin, and even add years to your life. The secret is the NutriBullet’s exclusive extractor technology which uses a 600 watt motor with cyclonic action and the patented extractor blades. This technology breaks down and pulverizes the stems, seeds, and skins where most of the essential nutrition lies – unlike what juicers and blenders do. Simply add your favorite fruits, vegetables and boosts (nuts, seeds, herbs) to the NutriBullet, along with some water, and extract the ingredients into smooth, tasty drink. And the best part is a NutriBlast takes only seconds to prepare, seconds to clean and couldn’t be easier to take on-the-go. Why extract food? Eating extracted food is great for EVERYONE in any state of health – from top performing athlete to someone suffering from fibromyalgia – because extracted food is virtually predigested, so your body can effortlessly absorb and utilize all of the nutrition that food has to offer. Even when we eat the healthiest foods, like a salad for example, it’s a lot of work for the body to break that salad down to get it ready for absorption into the body. When we prepare extracted foods with the NutriBullet, the foods are consumed in their most absorptive state, so we get the nutrition WITHOUT having to rely on proper chewing, effective stomach acids, digestive enzymes and the like to break down the food. It’s done for us!